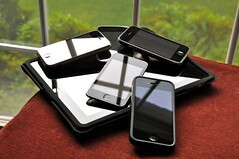 The mobile web shows no sign of slowing its growth; make sure you have a mobile website that's ready to compete! Mobile website standards, as with everything else related to the internet, have continued to evolve at an increasing rate and InsideOut Solutions is proud to announce a new mobile website solution for our Inndx and WordPress website customers that offers greater design flexibility, content management, search engine optimization features. This totally new version of our mobile website feature for WordPress websites is a major upgrade from the version we rolled out to our clients in May of 2011. The all-new administration interface makes management of your mobile website more efficient. 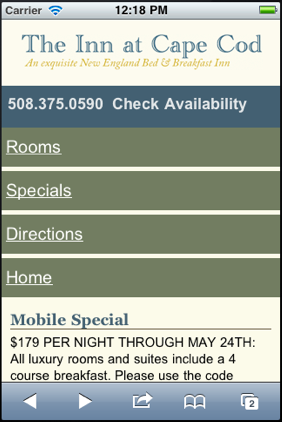 The mobile site as it displays to visitors is more user-friendly with larger, easier to click links. 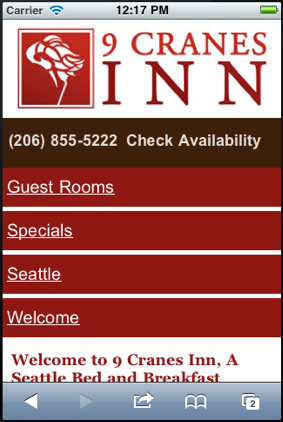 Previous mobile website was good, but we recognized a need for easier thumb clicking of menu items. The new mobile website for WordPress is "thumb friendly" and customizable to meet your mobile marketing needs. The new mobile website is packed with improved features to help clients improve their ability to effectively market their business in the mobile marketplace. The new mobile website settings include four layout themes; each customizable for a selected photo or logo. 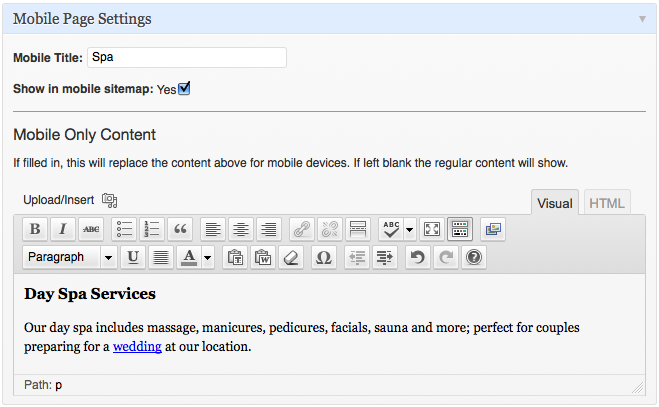 Easily add a page and customize the content for mobile website pages. Previously, our mobile websites were limited to 3 pages as tabs on a horizontal main menu and the rest in a “click to reveal” drop-down tab. The new mobile feature allows you to add as many of your pages to the mobile website’s new vertical page menu as you like via the Pages administration. You can also customize the menu item title to keep them shorter for mobile users. The “mobile-only” special editor now allows for text formatting, including use of headers, bold, italic, links, etc. just like the pages of your website. Easily edit and apply text formatting, links, etc. to a special that will only display to mobile device users. Let InsideOut Solutions provide your Inndx or hosted WordPress website with an effective mobile solution! The mobile device user has the option view the full version of the website and easily return to mobile version. Price for an entirely new mobile website is $400 for individual businesses and $625 for association/organization websites built in WordPress. Upgrading from the previous version is priced at $160. These prices include a free instructional video for editing your mobile website after it launches.